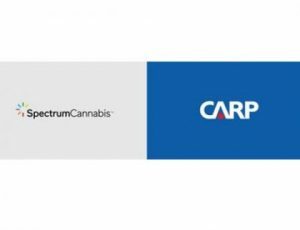 TORONTO and SMITHS FALLS, ON, April 12, 2019 /PRNewswire/ – Spectrum Cannabis, a wholly-owned subsidiary of Canopy Growth Corporation (TSX: WEED) (NYSE: CGC) (“Canopy Growth”) is pleased to announce a partnership with and endorsement from CARP, Canada’s largest and most trusted advocacy association for aging Canadians and its print, online, radio and TV voice, ZoomerMedia. Spectrum Cannabis will be offering tailored educational initiatives for over 320,000 CARP members seeking more information on medical cannabis, along with preferred pricing for Spectrum Cannabis branded products which have received the “CARP Recommended” seal. “This partnership with CARP, an organization dedicated to improving the lives of Canadians above the age of 45, will help to disseminate accurate information and quality products to a patient demographic that is highly engaged in learning more about how medical cannabis can improve their quality of life when conventional medicine just isn’t enough,” commented Mark Zekulin, President & Co-CEO, Canopy Growth. “As this new therapeutic industry continues to blossom in Canada, inaccurate and misleading information can be very detrimental to patients’ health and well-being, as is self-medication through the recreational system. Accordingly, Zoomers or Canadians that are 45+ are eager for knowledge and assistance regarding medical cannabis. After surveying the market carefully, we can confidently recommend the medical cannabis products offered by Spectrum Cannabis. Equally important, the company is not only devoted to the science based medical cannabis of today, but also does research & development into improved strains and delivery formats for the future,” said CARP President and ZoomerMedia Founder, Moses Znaimer. CARP is Canada’s largest advocacy association for Canadians As We Age. CARP has ±320,000 members and a network of chapters across the country. Most CARP members also subscribe to Zoomer Magazine, watch ZoomerTelevision/VisionTV, and listen to Zoomer Radio (AM 740/96.7FM/ZoomerRadio.ca). For more information, please visit carp.ca. Founded in 2008 by Moses Znaimer (Citytv, CP24, MuchMusic, Bravo! etc. ), ZoomerMedia is Canada’s only diversified multimedia company devoted to creating content, services and experiences for Canada’s largest demographic – “Zoomers” or the 16.1 million Canadians aged 45plus – on all platforms: television, radio, print, digital, and live events. ZoomerMedia’s television properties include VisionTV, Canada’s only multi-faith specialty television service available in 9 million homes; ONETV: Get Fit, a 24-hour fitness and health channel with yoga and exercise programs viewers can do from home; JoyTV in Vancouver, Victoria, Surrey and the Fraser Valley; and FAITHTV, the Nation’s Faith Station. ZoomerMedia’s radio properties include The New Classical FM (96.3 FM in the Greater Toronto Area/103.1FM in Eastern Ontario/102.9FM in Southern Georgian Bay), English Canada’s only commercial all-classical music radio service; and Zoomer Radio (AM740 and 96.7FM in Downtown Toronto), playing ZoomerHits – Music That Changed The World. ZoomerMedia also publishes ZOOMER Magazine, the largest paid circulation magazine in Canada for the mature market, everythingzoomer.com – Canada’s leading provider of online content targeting the 45plus demographic, and On The Bay Magazine, a regional lifestyle magazine published quarterly for the 20 towns and villages of Southern Georgian Bay, Ontario. ZoomerMedia’s tradeshow division operates The ZoomerShow in Toronto and Vancouver, Canada’s largest annual lifestyle expos and consumer shows for the 45plus, and produces Moses Znaimer’s ideaCity conference, the 3-day Toronto-based conference celebrating its 20th anniversary this year. Both ZoomerMedia and CARP are located in The ZoomerPlex, a 2.6-acre state-of-the-art production and live event complex in Toronto’s Liberty Village. From our historic public listing on the Toronto Stock Exchange and New York Stock Exchange to our continued international expansion, pride in advancing shareholder value through leadership is engrained in all we do at Canopy Growth. Canopy Growth has established partnerships with leading sector names including cannabis icon Snoop Dogg, breeding legends DNA Genetics and Green House seeds, Battelle, the world’s largest nonprofit research and development organization, and Fortune 500 alcohol leader Constellation Brands, to name but a few. Canopy Growth operates ten licensed cannabis production sites with over 4.3 million square feet of production capacity, including over one million square feet of GMP certified production space. The Company operates Tweed retail stores in Newfoundlandand Manitoba and has entered into supply agreements with every Canadian province and territory. For more information visit www.canopygrowth.com. This news release contains “forward-looking statements” within the meaning of the United States Private Securities Litigation Reform Act of 1995 and “forward-looking information” within the meaning of applicable Canadian securities legislation. Often, but not always, forward-looking statements and information can be identified by the use of words such as “plans”, “expects” or “does not expect”, “is expected”, “estimates”, “intends”, “anticipates” or “does not anticipate”, or “believes”, or variations of such words and phrases or state that certain actions, events or results “may”, “could”, “would”, “might” or “will” be taken, occur or be achieved. Forward-looking statements or information involve known and unknown risks, uncertainties and other factors which may cause the actual results, performance or achievements of Canopy Growth or its subsidiaries to be materially different from any future results, performance or achievements expressed or implied by the forward-looking statements or information contained in this news release. Examples of such statements include statements with respect to tailored educational initiatives. Risks, uncertainties and other factors involved with forward-looking information could cause actual events, results, performance, prospects and opportunities to differ materially from those expressed or implied by such forward-looking information, including discounted pricing, product availability and such risks contained in the Company’s annual information form dated June 27, 2018 and filed with Canadian securities regulators available on the Company’s issuer profile on SEDAR at www.sedar.com. Although the Company believes that the assumptions and factors used in preparing the forward-looking information or forward-looking statements in this news release are reasonable, undue reliance should not be placed on such information and no assurance can be given that such events will occur in the disclosed time frames or at all. The forward-looking information and forward-looking statements included in this news release are made as of the date of this news release and the Company does not undertake an obligation to publicly update such forward-looking information or forward-looking information to reflect new information, subsequent events or otherwise unless required by applicable securities laws.